In Mexico, egg dishes with red and green sauce are called Christmas eggs. As a staple, I keep hot sauces in my fridge at all times. This dish is easy and quite delicious. Once your bread is toasted spread a layer of beans on top. Next make your scrambled eggs. Once they are done add in two sliced of cheese and let melt. Add salt an pepper. Now its time to stack. 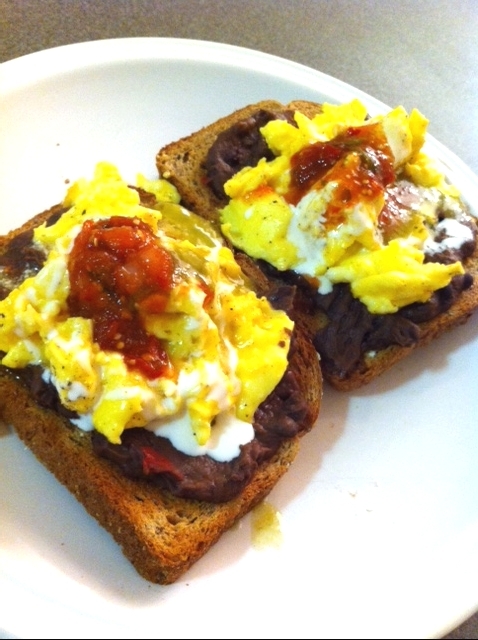 Place eggs on top of the beans, drizzle with crema, red and green salsa.